Welcome to this edition of A Labour of Love: 10 Years of Creativity, Community, and Care, coming to you late but safe from a mighty mercury retrograde, and we're still celebrating the wonderful people we work with and how the studio has impacted them! In this edition, we’re speaking with Mercedes Sharpe Zayas, former researcher for The Public and current collaborator via Parkdale Activity-Recreational Centre (PARC) and Parkdale People’s Economy. Mercedes produced our zine on Art, Design, and Gentrification that looks at how we can resist the ways gentrification often uses art and design to push marginalized communities out of their neighbourhoods. Since then, she’s continued to facilitate community-led projects with us on women of colour leadership, harm reduction, and mental health resources in Parkdale. The Public: We’ve been chatting with team members and clients, and with you, it’s a combination of both, which is great! We were also looking forward to speaking with you because of the work we’ve been doing together in Parkdale. Can you start with telling us how you first met The Public? Mercedes Sharpe Zayas: The first time I heard about The Public was because I was trying to find a space that combined design with systemic ways of thinking of issues and a community-based lens. A couple of my friends when they heard me describe this idea of something that I wanted to see in this city told me, “Oh, this actually already exists!” and they they directed me to The Public Studio. So from there, I was given the opportunity as a researcher for The Public to create a zine critically looking at the role of artists and designers in gentrification. I had already done a little bit of work in Parkdale, and of course The Public was trying to grapple with this issue of being a studio that’s in some ways nomadic, having been displaced and priced out of different spaces, and then found this wonderful home here in Parkdale, but at the same time, grappling with what it means to be an arts space in a rapidly gentrifying neighbourhood. The zine really works through some of the ways we can creatively think about this kind of contentious role, while also focusing on what the solutions are: what are some of the more action-oriented ways that we can actually battle with this idea of being complicit in gentrification processes while also simultaneously feeling the effects of gentrification processes? I was really excited about this project, not only to have a supportive environment where we can test out ideas, but also to hear directly from community members, artists in the community, and from people across the city who’ve been working through these issues. What I also thought was really exciting about the project, was that we weren’t trying to say “This is the answer”. We very much acknowledged that this is a work in progress that even the way we start to define gentrification, the way that it manifests in a community, and the way that we are all actors within that process was something that is constantly changing, and our politics are constantly evolving with that. TP: We have a whole collection of other DIY zines, but the Art, Design, and Gentrification zine in particular felt especially catalyzing. Can you tell us more about some of the ways the zine was a first step in a larger process of collective capacity building in the neighbourhood? MSZ: I think one thing that’s really important to foreground is the community in which we’re currently operating and struggling together. Parkdale is a traditionally working class neighbourhood; it’s a place where about a third of the community are newcomers, a third of the community are living in deepening poverty, many community members are psychiatric survivors, and many of the people living and working here are also racialized, and so when we talk about gentrification it’s important to recognize it as a racialized-class project. Something that’s very much so rooted in settler colonialism and a white spatial takeover of a community that manifests itself by pricing people out, by uprooting connections. So when I started my work with the Parkdale People’s Economy right after I finished my research position here at the studio, I was able to take that really beautiful lens that we were able to construct together of approaching this problem through the lens of decolonization, abolition, and intersectional feminism, and root that in the lived experiences of the people I was encountering day to day. One thing that really stood out to me as I started this kind of community-wide planning work in Parkdale is the strength of the community. The people who live and work in this community are phenomenal and there’s such a strong culture of resistance. But one thing I was struck by was that in the more formal spaces, whether it be organizing circles or local organizations, I noticed that the people who are often taking leadership roles within the community weren’t in any way reflective of the diversity of the neighbourhood in terms of race, class, gender, mental health, citizenship, and so on. So these spaces are usually very white male dominated, and even though a lot of the movements taking place here in the neighbourhood are very representative of the local communities, that just wasn’t translating into these leadership roles. When an opportunity to address this arose, I immediately reached out to The Public to see if there was some way we could collaborate. We wound up co-creating together the Parkdale Leadership Training Series, workshops specifically for Black, Indigenous, women of colour in Parkdale. Not to learn about leadership, because a lot of them were leaders in their own right, but more so to cultivate a space where people could feel comfortable coming into that leadership role in organizing spaces and asserting themselves by figuring out what leadership meant individually, and what leadership meant collectively in the neighbourhood. What was really amazing about the series was that we could offer it as a paid opportunity which can sometimes be rare, and we were able to have stories shared by people who were already doing this work in the neighbourhood. The workshop series focused on three core areas of organizing: at the grassroots level, in non-profit spaces, and at the political level. At each of these stages, we heard from people who are women of colour leading the ways in these movements. So when we talked about grassroots organizing, we heard directly from Nadia and Diane Rajaram who are a mother and daughter duo based here in Parkdale who were leaders in the Parkdale Rent Strike, huge advocates in the Fight for $15, and who spoke about how they deeply integrate care into their practices when they organize. That notion of care was something that really struck the people who were part of the leadership training series. In the second session, we had Angela Robertson from Parkdale Queen West Community Health Centre, as well as E.M. Uzoamaka who’s a board member for the Parkdale Neighbourhood Land Trust and also participates in a bunch of other organizations in the neighbourhood. They were really able to talk about how to cultivate radical love in the community and what that looks like. 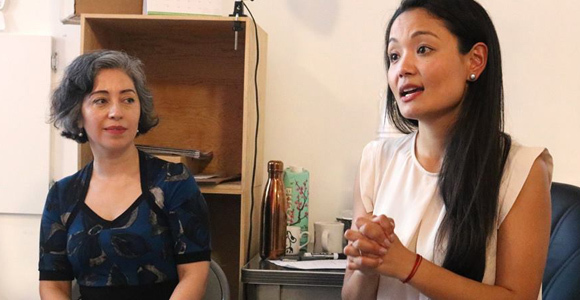 And then in the third series, we heard from Bhutila Karpoche our local MPP and Alejandra Bravo who has been mentoring my work in the neighbourhood around local organizing for fair economies. They were able to really talk about what it means to take power in these political leadership spaces and how to organize towards that. It was really beautiful how Sheila provided a space for the women to identify through their own lived experience and care for the neighbourhood that there was a lack of spaces for mental health and community information. So often mental health is something that can be stigmatized and that’s especially heightened when it comes to different cultural settings, so the women envisioned an opportunity to create a peer-led support space where anyone who is either going through a certain stressor in their life, or really deeply intergenerational trauma, would be able to come together with people who look like them and talk that through, and just have someone there to listen, support, and guide them towards resources. This is what we’re building towards now and through that process we’ve been really lucky once again to work with The Public. Sheila has been able to provide us training for how to create zines, as well as harm reduction training with Liz Merlos from Parkdale Queen West Community Health Centre from which the women were able to voice what they learned and co-write a zine. For a lot of the women, several of whom are literacy learners, being able to see that they actually wrote a zine and to see that in print brought them to tears. Likewise, we were able to do a recent workshop series on peer feminist counselling training and it once again, brought a lot of those principles around harm reduction into this level of supporting one another. I work out of the Parkdale Activity-Recreation Centre (PARC), which is a drop-in center for people living with mental health, substance use, poverty, housing insecurity and so on. The women in the leadership group themselves are impacted by mental health in their own ways too—as we all are—and they’re open to expressing that, but it’s a different form radical inclusivity that I think is borne from the kind of spaces they’re trying to create. We have a lot of mental health services in the neighbourhood which is amazing to have, but I think what they’re identifying as a gap is this idea that the community can also uplift and support people when they’re going through crises. They’ve also identified it as a way to diverge away from those more institutional players. Like how can we ensure that people are no longer calling the police when mental health crises happen, or ensuring that people aren’t just being institutionalized time and time again? How do we build networks of care within the community so that people can be uplifted? That’s one of the core ideas that came out of that group, and I think it’s something that is so beautiful. TP: Have you noticed any ways that you’ve changed in working with The Public, the Parkdale leadership group, or PARC? MSZ: When I was first working at The Public Studio, I was coming out of academia and you can sometimes get this ingrained way of thinking, this idea of teaching versus building collective knowledge. This idea that you cannot be vulnerable in your own uncertainties. That’s something that I was able to unlearn and use as a transition space here in the studio and really ground that in my community work that I’ve been doing on the day to day here in Parkdale. I can’t even begin to express my gratitude for everyone here. There’s so much value in having humility in the work that we’re doing; there’s such a playful attitude that’s always present at The Public that I always feel the second I walk in those doors, that I’ve really tried to embody in the spaces that we carve out in the neighbourhood. You don’t want the movement to be overly serious, you don’t want it to be as through we have all the right answers. We’re figuring this out all together and so it’s not about following someone walking in front of you, or leading someone walking behind you, it’s about moving forward together and figuring out our path along the way. So that’s something that I kind of was able to really build and cultivate here in the studio, and learn from members of the community. I’ve also really been impacted by the conversations we’ve had as a group around stress management, which could seem like a very simple topic to work through and navigate, but what I found really fascinating when we went into this conversation was that it immediately started reflecting back on the different institutional stressors that are brought on the women’s day to day. We talked about the impacts of the prison industrial system on our families, the impact of OW and ODSP on food security and the ways that that then manifests into housing insecurity, and the ripple effects of precarious work and how that can impact how we care for children. We were able to take that step back and say “how can we cultivate the space that’s necessary to reduce those institutional stressors that are very systematically set against us?” That was something that really resonated with me in terms of how they’re able to bring these incredibly large systemic analyses and bring that into how we can move forward in our own collective fight for the community. My mind is constantly blown by the kinds of ideas that come from just those kinds of collective work sessions in the neighbourhood. One thing we always remind people is that no one knows everything, but together we know a lot. Through this, we are able to build ideas with so many people from so many diverse backgrounds and lived experiences, who are really able to bring their full selves. It wouldn’t be the same if it was a more homogenous group of people coming together, or people who all saw through the exact same lens. It’s really amazing to see that people can come from such different ideological compositions, but still ultimately hold this core value of community that they’re fighting for. That’s something that has always really helped expand my mind beyond even my own lenses and ideologies that I have in place. TP: What are the next steps for you and the people you’re working with? MSZ: One thing we’ve now done in practice through the help of the studio and that we’re hoping to incorporate more and more in the work that we’re doing at the Parkdale People’s Economy is this idea of really being able to foster spaces for people to co-author and take ownership over the kinds of materials we’re producing. Because in the past some of our work, we’d do these really deep participatory planning processes and cultivate all this knowledge, but then ultimately a lot of the authoring would be held by one person, like with the reports we would put out. What I really loved and learned through the process of writing our harm reduction zine was what it means to actually assert these kinds of learnings through people’s own words and their own analyses of the situation. We recently created a community benefits framework, and that framework is nothing if it’s not for organizing and bringing it to life and moving it forward, so we wanted to co-create an organizing manual that would be co-written by community members who’ve helped us in many ways come to the community driven demands that were articulated in the framework, but might not be currently be written in the language that they would define it as. That was something that I found really interesting in terms of that shift of who takes ownership of the writing and what a different impact that could have in terms of who can actually access material and feel a true connection and sense of ownership over it. Even as I work alongside the Parkdale Neighbourhood Land Trust, it’s this whole idea of collective ownership of land governance and ownership and once again it comes back to this idea of how do you build radical practices of love within community. It’s something we’re just constantly trying to strive and build towards. That’s something that I’m looking forward to, but that’s also grounded in the learning that I’ve had here at The Public. TP: There’s so much love that flows through this work, and there’s so much more we could talk about on the topic of radical love. How would you define radical love at this point? MSZ: It’s in many ways a very relational practice. When I think of love in the context of the people who I work with broadly in community, it’s this idea that it comes down to practicing an ethics of care and holding space for individuals who might not be feeling love in other spaces for a number of different reasons, whether it be isolation, stigmatization, systemic oppression, and so on. Especially working at PARC, so often the void that’s not filled among our members is that feeling of love, recognition, or respect. I’ve found that by opening up my heart to people and being caring in a way that’s not institutionalized is something that I think is really needed in this work. That’s one way I think of radical love, but then there’s also this broader idea of how do you bring people together and value people’s experiences and not think that we’re working in a vacuum, that we’re not whole beings when we’re organizing together. That’s another way that practicing radical love, self-love, and collective love comes into play and you have to make sure that you’re not only caring for yourself or that other people are caring for themselves, but that we’re caring for one another, and that then allows us to build our movements even stronger. TP: Thank you so much, Mercedes!